Kalonji/Black Seeds Oil Benefits for Weight Loss | Recipes & How to Use Daily? Although Kalonji Seeds have been in use since a long time, they gained popularity only in the recent times, all because of increasing cases of Obesity and other health related issues. More than anything, it is highly advised to the overweight individuals to use Kalonji or Black Seed Oil to lose weight. Kalonji seeds or Black cumin seeds or Black seeds are nothing but one of our oldest Indian spices commonly used in the kitchen. It is associated with the humans since the era of early Egyptian Pharaohs. The biological name of Kalonji is Nigella Sativa. However, it is known by different names in various languages. A 100 gms serving of Kalonji seeds has 40 grams of dietary fiber, which is 160% of your daily value. If you don’t know already, fiber is very beneficial when it comes to weight loss and in severe cases of constipation. It also has 16 grams of protein, 119% DV of Calcium, 102% DV of Iron and lots of Vitamin C, Magnesium, Potassium etc… It is also low in saturated fat and net carbs, which makes it an ideal for weight watchers. 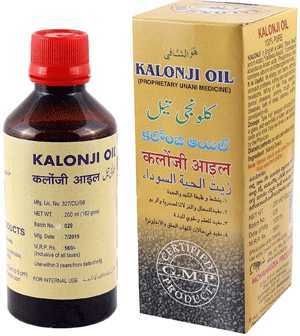 The major components in Kalonji are ‘Nigellone’ and ‘Thymoquinone’. It also contain a lot of essential fatty acids namely Arachidonic acid, Linoleic acid, Linolenic acid, Myristic acid, Oleic acid, Palmitic acid, Palmitoleic acid and Stearic acid. Almost 15 amino acids that are vital for our body are present in the Black cumin seeds. How Does Kalonji Help in Weight Loss? 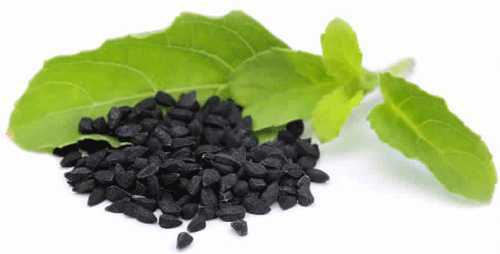 One of the many advantages of Black cumin seeds or Kalonji is blood sugar controlling. It regulates the metabolism of carbs in the body, thereby preventing sugar cravings, thus helps in losing weight naturally. Since it is also rich in dietary fiber and antioxidants, your body will easily get rid of toxins/waste and promotes healthy digestion. Thanks to the carminative nature of these seeds, you’ll also get rid of bloating and gas. The fiber and protein content in the seeds keep you full for longer duration. So, by curbing your appetite, Kalonji seeds makes sure you don’t overeat. The essential fatty acids in Black Jeera help in lowering triglycerides and blood cholesterol levels, thereby aiding weight loss. You can choose either the Kalonji seeds or Kalonji oil in order to reduce your weight. P.S: The oil is comparatively expensive compared to the seeds. And the seeds are easy to use while cooking without going overboard. How to Take Kalonji Seeds for Weight Loss? 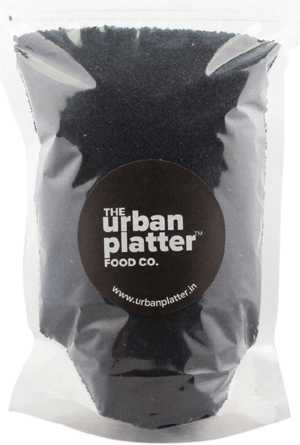 You can use the black cumin seeds while preparing your regular dishes/curries like you use the regular Indian spices. However, if you wanted to use them separately to seek more weight loss benefits, then you can follow the below recipe. Take a bowl and heat a glass of water until it gets warm (not too hot). Switch off the stove & add the seeds (crushed). Now, add a tbsp of honey and lemon juice (½ slice) to the mixture. Drink this solution on an empty stomach every day and you’ll see visible results within the first 7 to 10 days itself. Don’t stop there & continue using it to see permanent weight loss results. If you can’t consume the seeds directly, then the next best thing is to use the oil, which is also good for burning fat, but a little expensive than the seeds. Take the oil in a glass and add honey and cinnamon powder to it. Drink this mixture on an empty stomach every day, followed by a glass of warm water. Alternatively, you can add the Kalonji oil in your favorite juice if you don’t like the taste of it. However, do not add sugar while making the juice as it will hinder your weight loss benefits. Pregnant women should stay away from using the Kalonji seeds or oil as it might interfere with the Uterus and causes miscarriage. Lactating or Breastfeeding mothers can use it thrice per week to increase the milk production. Just add few drops of Black Cumin seeds oil to a cup of warm milk and drink it. Recommended Dosage of Black Seed Oil is 1 teaspoon of oil or 2.5 teaspoons of seeds. Children & Infants can use Kalonji but in limited quantities. The children below 12 years should consume ½ of what the adults consume i.e., ½ tsp oil or 1 teaspoon of seeds. The Infants should consume ½ of what the children consume i.e., ¼ tsp oil or ½ tsp seeds. It helps in developing strong immunity, stamina and healthy vital organs in children and infants. Below are the most popular health benefits of using kalonji regularly in your diet. Also find the recipes. Aids in Weight Loss: Just add a pinch of powdered Kalonji seeds in a glass of warm water along with honey and lemon to shed those extra kilos. Controls Diabetes: Just ½ tsp of oil in a cup of black tea every morning can help you control diabetes very easily in just a few weeks. Controls Blood Pressure: Drink ½ tsp of Kalonji oil with warm water and keep hypertension under control. Protect Your Kidneys: Add ½ tsp of Black seed oil in a glass of warm water with honey and you can get rid of kidney pain, stones and infections naturally. Stronger Teeth: Massage your teeth with curd & kalonji oil twice (once in the morning & once before going to bed) a day to strengthen your gums. Prevents Hair Loss & Premature Graying: Mix the Kalonji oil with Olive oil and Apple Cider Vinegar in equal proportions. Massage your scalp with this mixture to prevent hair loss and strengthen your hair root. Alternatively, you can also make a paste of the oil (10 ml), olive oil (30 ml) and mehendi powder (30 gms). Apply this paste 1 or 2 times a week, leave it for 30 minutes and wash your hair. It prevents balding of hair. Cures & Prevents Headache: Taking the black seed oil on a regular basis cures severe migraine. You can also rub the oil on your head to get rid of headaches. Healthy Heart: Goat milk (1 cup) mixed with the oil (½ tsp) consumed for a week helps in promoting heart health and also prevents heart attacks. Cancer Prevention: The oil (½ tsp) mixed with grape juice (1 cup) is beneficial in preventing cancer types like intestine, blood and throat cancers. Glowing Face & Beauty: Mix 50 gms olive oil and 50 gms kalonji oil and store it aside. Takes ½ tsp of this mix everyday before the breakfast. It helps you get a glowing skin within just a week of usage. Over consumption of anything good is obviously bad. Below are some of the common side effects of Kalonji or Black Seeds. Excess usage may produce more heat within the body, which may lead other health complications. People with Gastric Ulcers or Severe Acidity should stay away from using them as it aggravates the symptoms further. Don’t consume while pregnant or during menstruation, just to be on the safe side. Since it brings down the blood sugar levels, you should ensure not to club with anti-diabetic medication as it could lead to potential health risks. Do consult your doctor before taking Kalonji in that case.